$50 Off with Free Shipping! The TASER Bolt is small enough to fit in just about any purse or pocket, yet it gets the job done! 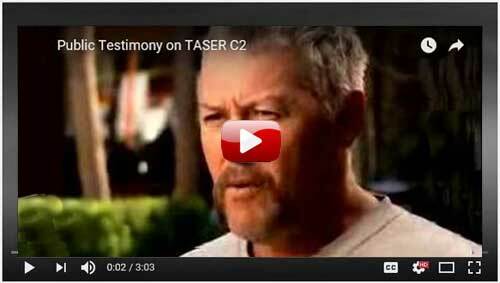 Watch this short video on the TASER Bolt (formerly named TASER C2)! 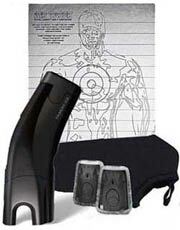 TASER Bolt Non-Lethal Alternative: TASER technology saves lives throughout the world every day. 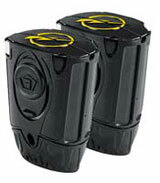 The TASER Bolt utilizes compressed nitrogen to project two small probes 15 feet at a speed of 180 feet per second. The probes can best be described as fish hook darts, that are connected to the device by two 15 feet high-voltage insulated wires. A 50,000 volt, 7 watt electrical signal is transmitted throughout the region where the probes make contact with the body or clothing for 30 seconds. This results in an immediate loss of the person's neuromuscular control, balance and the ability to perform coordinated actions. Watch a 1 minute demonstration video on the TASER Bolt (formerly named the TASER C2) by clicking here. 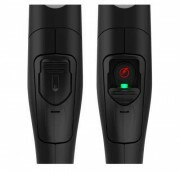 TASER devices verses direct contact stun guns: Many wonder if direct contact stun guns are more powerful than TASER devices, being their voltage is so much higher. 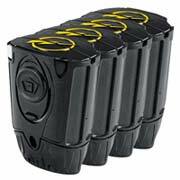 TASER models deliver a stronger shock than our higher voltage stun guns, being all 5 TASER models' wattage and amperage output is much higher. 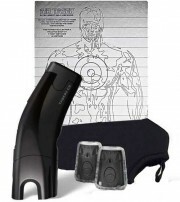 Even though our higher voltage stun guns are effective in disabling assailants at close range (stun guns do not fire darts - the unit itself must touch assailant), all TASER models have more take down power, and disable assailants from 15 feet away. Your TASER Support Representative: All TASER customers are assigned a TASER Support Representative to address any questions or concerns they may have after the sale. You will be able to reach your TASER Support Representative by phone or email. Your TASER Support Representative will email his or her contact information before the end of the next business day after the sale. Please note that TASER Support Representatives are employed by World Net Enterprises, parent company of DefenseProducts101.com, and not the manufacturer. 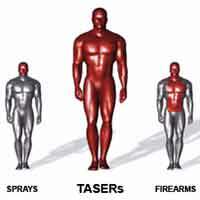 Legal To Carry: TASER devices are not considered firearms. They are lawful to own in 46 states. They are banned from regular citizen use in four states, including HI, MA, NY & RI. Click here to view a "TASER Laws Statutes Summery" on the possession and use of stun products in your area (law enforcement and consumer). Lifetime Replacement Guarantee: On rare occasions TASER device owners have been known to fire their unit at an assailant, and then drop the device and run. If your TASER Bolt (formerly named TASER C2), TASER Advanced M26c or TASER X26c is used is used for self-defense, and for some reason left behind at the scene, send the manufacturer a copy of the police report documenting what happened and they will replace your unit free of charge. 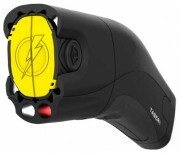 TASER Lifetime Replacement Guarantee is not available or applicable for: (a) on any international (Non-United States) sales or uses of TASER devices; or (b) to any Purchaser who uses the TASER device in a professional capacity. Click here for more information on the TASER Lifetime Replacement Guarantee.